The blog title attracts readers. On the search engines and social media, titles represent the content. 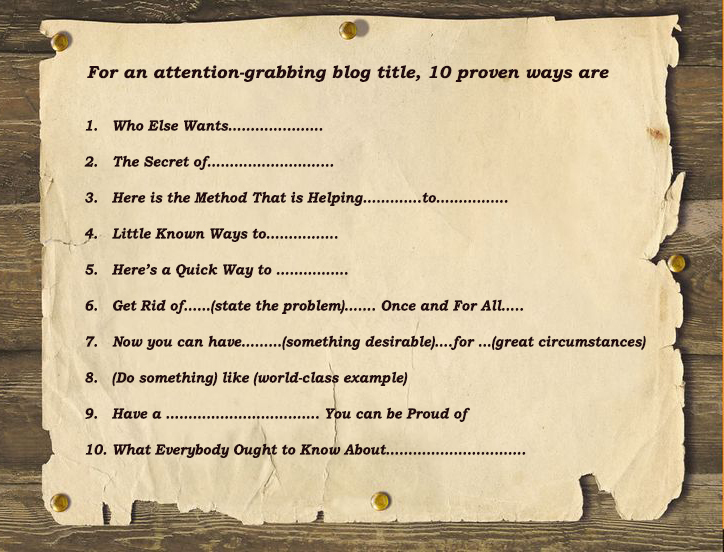 Copyblogger states that out of 10, 8 will read the title and only 2 will read the complete content. Write an eye-catching title and your blog which otherwise would have gone unnoticed will fetch numerous social share, share and boost in ranking. While crafting a compelling headline, common questions might confuse you- What words to use? How long it should be? Writing an effective title for a post needs patience and testing. Often tweaking a title has a direct effect on the conversion rate. So, you need to keep a watch at what will work and how little variations can change the performance. To improve the chances of success, you need to do your groundwork right. Emphasizing on few areas will give you favorable results. Know your target audience first– Identify who they are, their age and occupation and most importantly what problems they face. Since keyword plays a vital role, identify the ones that your post is targeting. You need to have a clear understanding as to how short and long-tail keywords are supposed to perform. Your title will fall flat if it does not correspond with the specific theme of your blog. Once you know the target audience for your post and the keywords, it will be easy for you to craft a title. However, make sure that the length of the title is not beyond 62 characters, as search engines ignore the rest and in the long-term affects the conversion rate. Analyze your blog title prior to posting it. The following analyzer might come handy to know the strength of the Blog Title. Psychology and data go hand in hand while writing a catchy title for a post. For creating a powerful blog title there are five mantras that will increase social share, traffic and ranking. Title contributes to almost 50 percent of blog’s effectiveness. Using specific numbers in a title makes it enticing for the readers. Research shows that titles that have numeric in it results in 73 percent more engagements and social share. Numbers speak louder than words. Odd number seems to be more authentic than the even counterparts. You need to understand the science of using odd numbers. People can remember and recall odd numbers easily. Tweaking a title by including an odd number increasing the click through rate by almost 20 percent. Another trick is to replace the word by a numeric, i.e. replace ‘five’ with ‘5’. If you want people to read your content then give them a good reason to do so. It is a proven methodology as experts have already implemented it while writing powerful titles that went viral. Few words you can use in the title are: Tips, Tricks, Lesson, Ways, Ideas, Secrets, Reasons, Strategies, and Principles. What is the sole aim of your blog title? Simple, to capture the attention of your readers. If research findings are to be true, then this is an important area that you need to invest in. Reports say that the attention span of people is decreasing gradually. Statistica states that average attention span is almost 8.25 seconds. If your viewers have paid attention to your title, then the engagement increases, which automatically makes social sharing easy. Your great content might fail to make a mark on the customers and will not engage them if the title does not catch the attention of the readers. Craft a unique title that is different from anything that is found on the internet. If you are not sure then please search it after crafting the title. Be ultra-specific with your title. Write a precise title that answers every question of your readers. This will help in building stronger connection with the readers. Avoid any form of ambiguity in the title and set specific objectives. Convey urgency through the title. Urgency and scarcity are two important elements for creating powerful titles. If you infuse urgency in the title there are chances that your viewer will read the content or bookmark it. The secret is to persuade readers by urging their emotions and justifying it with logic. ECommerce are forerunners in using the scarcity for their titles. Make your title useful, informative, beneficial, practical and valuable to the readers. After reading it the customers need to feel that it conveys solution to their problem. Correct use of words– You have adopted these tricks for writing a title, now you need to know what words you need to mention in a title. Make sure that your title is easy to understand and makes sense to your readers. Interesting adjectives like Fun, Free, Essential, Absolute, Incredible will make your title powerful. Another must mention word is You, it connects the readers well. Emotional words or power words like Amazing, Breathtaking, Faith, Hope, Sensational, and Spectacular in the title, urge the readers to take action. Wise use of these words will tap in emotion of customers and increases the count of social share and sales. Each copywriter has their individual formula of writing a title. Few write it before writing the post and few prefer writer after completion of the post. Experts have outlined various formulas for writing a title. Often copywriters and marketers restrict their effort only to write an in-depth posts, but it is equally important to write an in-depth blog title. Make sure to assess the success of your blog title, or both your money and time, utilized for it will go wasted. Metrics to use for measuring- inquiries and social media shares. These are proven ways that assure fast conversion and faster sales with a powerful blog title. Implement these wisely and you can see considerable change in the social share data and engagement rate. Russian time team principal Igor Mazepa go2article.com.